For lunch today I stepped out to the local A&P store and went to the salad bar. A couple of cups of spinach, cucumber, tomato, salad dressing, some pineapple and berries and I was good to go. Later I calculated it all out and lunch was a grand total of 250 calories. This is easy for me. It wasn’t always but it is now. I passed a Chinese buffet, three pizza parlors, one bagel joint, a Memphis BBQ place, and a McDonald’s’ on my way to the A&P and the salad bar. I would have given up on the A&P and gone to anyone of the temptations listed above. Not now. I think about it. I think about how much I love a good Chinese buffet. I love BBQ. I even like McDonald’s. I just don’t eat that way. I don’t eat red meat so the McDonald’s is pretty much out. I rarely have pizza (two slices in the last year plus) and today is not a day for bagels…. Lovely woman cashier teased me about the light lunch. “Thin as you are you should eat more than a salad”. When I told her I had lost 100+ pounds and that is why I eat this lightly She was amazed, congratulated me and told me I look wonderful. I heard her telling the cashier next to her “that guy lost 100 pounds!” as I walked towards the door. I will be walking a little lighter today from the good feeling that gave me. Just after I finished my lunch my boss poked his head in my office and asked if I wanted to order Chinese. Old Days: Despite having the salad I say YES and order General Tso’s Chicken. Today? No thanks, just ate. Had I not had a salad? I would have ordered soup. You can do it. It just takes making the right decisions one decision at a time. When I started this Journey I was petrified at the thought of allowing any sort of indulgence. I still avoid them. The reason is simple: allow it today, becomes OK tomorrow, becomes 310 pounds…. Now that I am below my goal weight I have learned that I can have one bad day and get back on it the next day. I still watch it like a hawk and I expect I always will but I have learned to not panic if I allow that one day out of 30 where the calorie count goes high or the piece of birthday cake is a little too large… I have developed the discipline to allow that on the very rare occasion and still get back to the plan, keep on track. 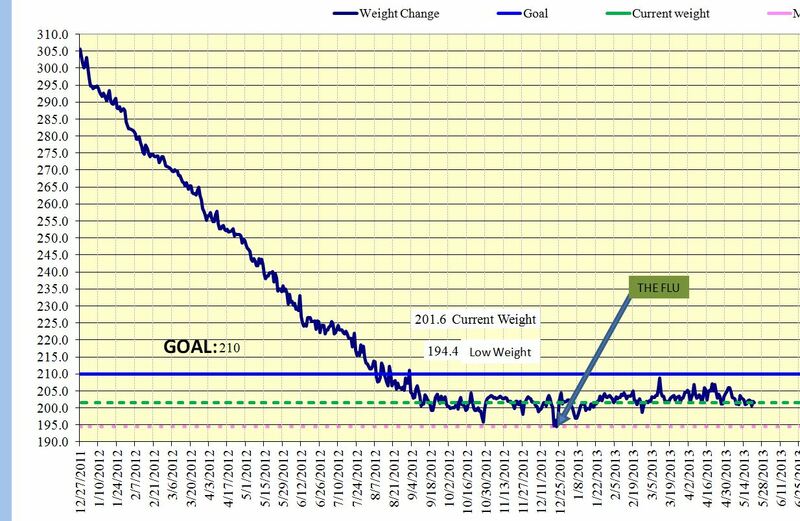 That I have maintained my weight below the goal weight since last August 8, 2012 is evidence that I am able to get back to plan very quickly after a day on the wild side. I will not get smug about this. I am still ever watchful. I must be. I just won’t panic now if I have that one day above plan. I have learned to not let it become two days. I have had to learn to listen to my body. I never did. I certainly didn’t listen when I was getting it beyond heavy to obese. I pushed past the warning signals, the cry for mercy. I simply refused to hear. As I started my Journey I maintained the same habit. I would not listen when my body begged me to rest. I pushed because I knew my body was a liar. I was asking it to wok and it was telling me it couldn’t. This was why I tried to cycle even though I had injured my knee. I wanted to believe I could push my body past the pain and keep up the activity level and the calorie burn. I pushed when I had head colds, the flu, aches and pains. I am certain I made problems worse (I certainly did with my knee) by doing this but I was driven to get fit. Now I am working on listening. I have been dealing with the remnants of a head cold and I dearly wanted to get on the bike last night. I had to listen to the body. It told me no. The body said it wasn’t ready. My body was right. I mowed the lawn and then I had to rest on the porch for a bit. If I had tried to cycle I would have been calling Missus asking her to come fetch me. I am learning to trust what my body tells me. Not all the way there yet, I still suspect the body of lying now and again, but I am getting there. Pizza day in the office at work tomorrow. I didn’t know anything about this until I got a text a little while ago from a woman in the office telling me not to bring lunch because they are ordering in pizza. I texted back a thanks but mentioned I don’t eat pizza and will have my normal lunch. Yes I did say above that I can allow the occasional indulgence. That was birthday cake this weekend past. It isn’t pizza tomorrow. Discipline. People see me as lean. They don’t know what it took to get here. It confuses them. 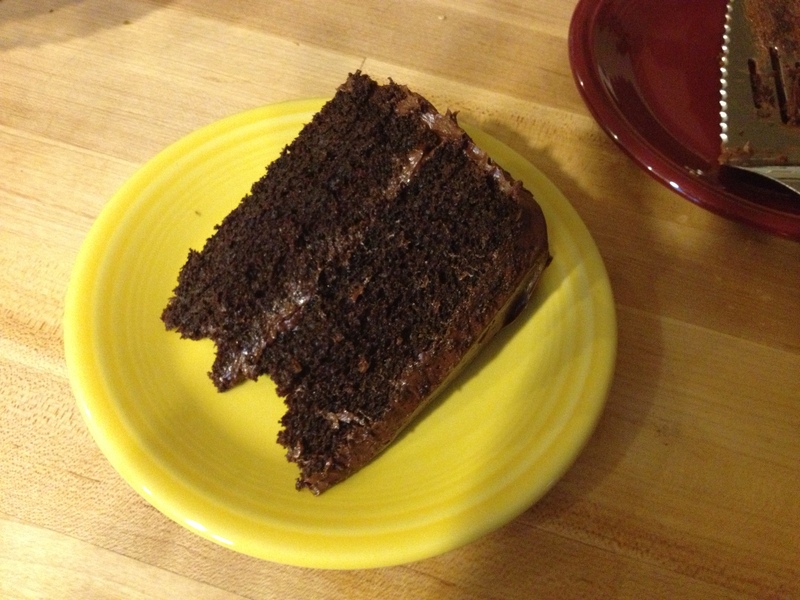 I am lean, why not enjoy a slice or two? Because I plan to stay lean. Decisions. As I said above, making the right decisions one decision at a time. Categories: bicycling, Cooking, Cycling, Emotional Well-being, fitness, Friendship, Fruits and Vegetables, Proper Nutrition, Vegetarian, weight loss | Tags: cooking, Cycling, dreams, evening snack, excuses, exercise, Father-Son, fitness, food, health, healthy-living, Hunger, Vegetarian | Permalink. Thanks for such a great positive message. Today is a new day for me. This was a great first message. Not NO pizza. Just something saved for a special occasion. A special occasion that occurs only if you’re on target, below goal, and with a running calorie deficit. A special occasion that occurs once every 18+ months. Yeesh. You’ve got discipline! Yes, this is true enough, there is a bit of hyperbole in the “don’t eat pizza” statement. Under very specific, highly controlled circumstances……..